Centers for Disease Control and Prevention (CDC). Identifying infants with hearing loss - United States, 1999-2007. MMWR Morb Mortal Wkly Rep. 59(8): 220-223. Vohr B. Overview: infants and children with hearing loss—part I. Ment Retard Dev Disabil Res Rev. 2003;9:62–64. Mitchell RE, Karchmer MA. Chasing the mythical ten percent: Parental hearing status of deaf and hard of hearing students in the United States. (PDF) Sign Language Studies. 2004;4(2):138-163. Blackwell DL, Lucas JW, Clarke TC. Summary health statistics for U.S. adults: National Health Interview Survey, 2012 (PDF). National Center for Health Statistics. Vital Health Stat 10(260). 2014. Hoffman HJ, Dobie RA, Losonczy KG, Themann CL, Flamme GA. Declining Prevalence of Hearing Loss in US Adults Aged 20 to 69 Years. JAMA Otolaryngology – Head & Neck Surgery. December 2016 online. Lin FR, Niparko JK, Ferrucci L. Hearing loss prevalence in the United States. [Letter] Arch Intern Med. 2011 Nov 14; 171(20): 1851-1852. Based on calculations performed by NIDCD Epidemiology and Statistics Program staff: (1) using data from the 1999-2010 National Health and Nutrition Examination Survey (NHANES); (2) applying the definition of disabling hearing loss used by the 2010 Global Burden of Disease Expert Hearing Loss Team (hearing loss of 35 decibels or more in the better ear, the level at which adults could generally benefit from hearing aids). Based on calculations performed by NIDCD Epidemiology and Statistics Program staff: (1) tinnitus prevalence was obtained from the 2008 National Health Interview Survey (NHIS); (2) the estimated number of American adults reporting tinnitus was calculated by multiplying the prevalence of tinnitus by the 2013 U.S. Census population estimate for the number of adults (18+ years of age). NIDCD Epidemiology and Statistics Program, based on December 2015 Census Bureau estimates of the noninstitutionalized U.S. population, personal communication; May 2016. Based on calculations by NIDCD Epidemiology and Statistics Program staff using data collected by (1) the National Health Interview Survey (NHIS) annually for number of persons who have ever used a hearing aid [numerator], and (2) periodic NHANES hearing exams for representative samples of the U.S. adult and older adult population [denominator]; these statisticis are also used for tracking Healthy People 2010 and 2020 objectives. 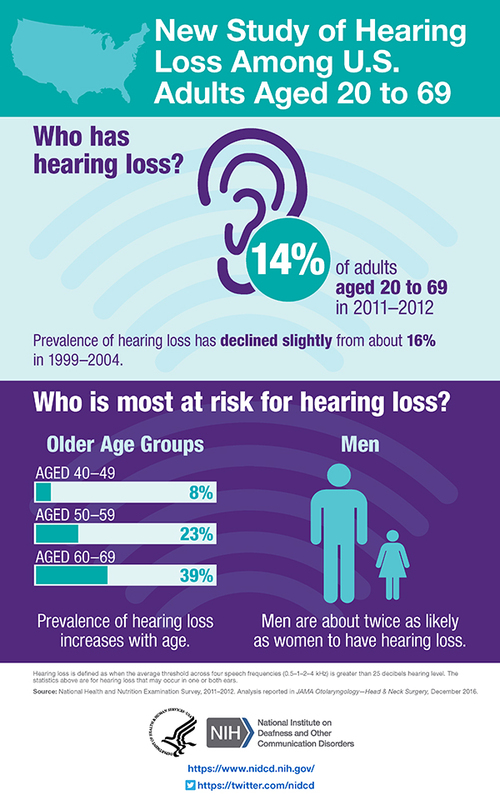 See also Use of Hearing Aids by Adults with Hearing Loss (chart). Estimates based on manufacturers’ voluntary reports of registered devices to the U.S. Food and Drug Administration, December 2012. Teele DW, Klein JO, Rosner B. Epidemiology of otitis media during the first seven years of life in children in greater Boston: a prospective, cohort study. J Infect Dis. 1989 Jul;160(1):83-94.